Coachella is here. The celeb favorite music festival is not only a tastemaker in the music scene, but both fashion and nightlife as well. Expect ample media coverage in the weeks to follow the double-weekend event establishing what bands have been blown out of obscurity, the must-have sandals as decided by festival-goers, and pool side kisses picked up by gossip columnist to set the stage for celebrity summer romance rumors. For those attending, it’s time to secure your day planner and zip up that suitcase. To help you out we’ve put together a guide of what to pack, where to party, and the music not to miss. Oh and: No selfie-sticks, please. The festival has officially banned them. Every year festival fashionistas help set the hottest summer trends with their looks from the weekend. 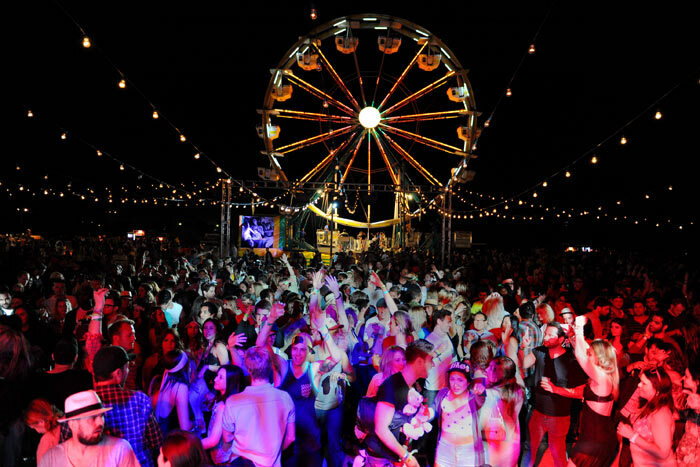 The festival’s hometown of Indio, CA tends to get hot during the days and cool down for the night sets, so while you’ll likely be sweating from David Guetta, bring a light sweater or cape for wandering around the fields in between sets or a midnight ferris wheel ride. Expect eclectic mish-mashing of textures and patterns as seen in this year’s Fall 2015 Miu Miu collection. Chic and feminine tutu skirts with 3D accents as seen recently by Chanel will appease couture rave princesses. Bowie-esque cat suits as displayed by Dior are both attention-grabbing and great for dancing. And of course: fringe. As far as beauty needs go, under the blistering sun the most important thing to remember is to wear sunscreen. The camping grounds have a free beauty bar offering complimentary blow outs and up dos with hair cuts and shaving for the men. In addition, beauty favorite Sephora will be set up next to the Mojave stage providing boho and glam make up services open to the public. The camp ground always becomes a communal party of shared beer and blasting speakers for the masses, but some festival-goers prefer pool side. Friday night (4/10) kicks things off at six-time sponsor H&M‘s annual poolside bash with a DJ set from HAIM. The VIP invite-only event will include appearances from Cody Simpson and Bella Thorne. On Saturday (4/11) A-listers will defuse from mid-festival madness with an inaugural Moschino party thrown by Jeremy Scott. The location is being held secret, but expect party antics from the likes of Jeremy Scott’s besties Rihanna and Miley Cyrus. Finally, guests can cool down Sunday at the Cynthia Vincent #CVCHELLA Brunch hosted by Cynthia Vincent and blogger Jenny Bernheim. Now that you look the part and are properly socialized, let’s turn our attention to the bands. It is after all, a music festival. While oldies but goodies such as AC/DC and Belle and Sebastian are grabbing attention, here at Untitled we’re looking forward to some of the up and coming acts. Friday night (4/10) don’t miss Kimbra, and be sure to check out our exclusive interview with the unique indie-pop star. Also on Friday: Lykke Li, Haerts, and Cloud Nothings. One of the most crowded stages Saturday (4/11) is sure to be for rap duo Run the Jewels who made major waves last year with the release of their follow-up record Run the Jewels 2. The pair will be joined on stage by Blink-182‘s Travis Barker. Also on Saturday: Perfume Genius, Father John Misty, and Cashmere Cat. Sunday (4/12) we’re especially stoked for tunes from Angel Olsen – one of the most astounding and sultry folk singer/songwriters we’ve enjoyed in sometime. Also Sunday: Marina and the Diamonds, Mac DeMarco, and Lil B.
CARLY RAE JEPSEN DEBUTS NEW TRACK "ALL THAT"